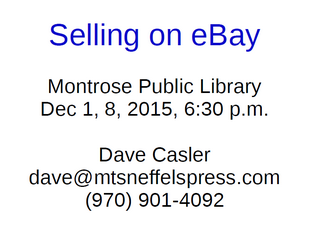 Click on the image to go to the PDF charts from the 1 Dec 2015 library presentation about selling on eBay. I taught a class last night at the Montrose (Colorado) Public Library to 21 students. As promised, you may get the charts by clicking here or by clicking on the image. The second half of the class is 8 Dec 2015 at the Montrose Library. This entry was posted in Computer Tips and tagged selling on ebay. Bookmark the permalink.